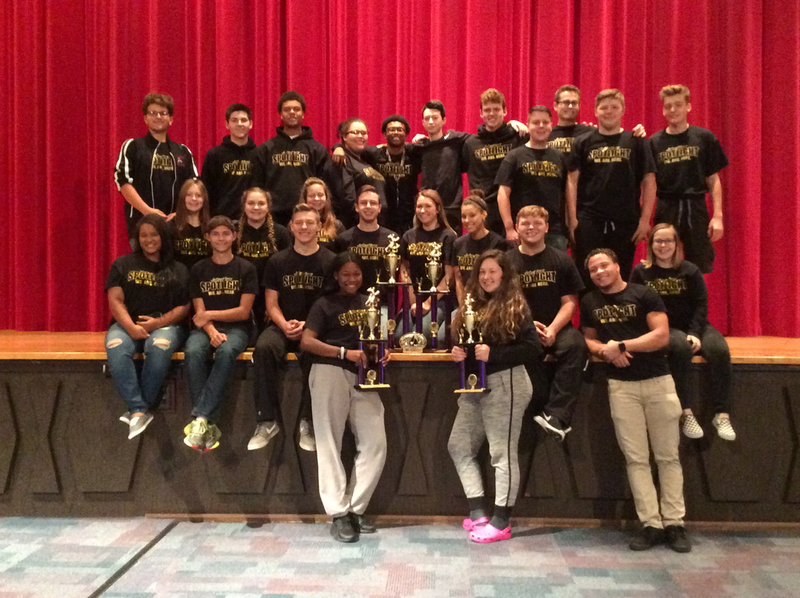 The Alliance High School Competition Show Choir, The Jetsetters, competed for the first time this season and brought back several trophies. At the Ada Music Feast on November 4 the 31 ninth through twelfth graders won in their Class B division for Best Choreography, Best Vocal Performance, and received Grand Champion in their division. Division B, which the group competed in, was made up of other high schools with similar size in enrollment. Although many of the students in Jetsetters this year were new to the performance group, Director Carrie Chunat said they are a dedicated group that works hard and performs well. “I was very pleased with the kids work ethic and positive attitudes this year. They wanted to do a fall competition knowing it would mean extra work in the summer months, and they worked really hard to prepare. I was very proud of the performance they presented, and I'm excited to see them continue to improve this year,” she said. This years Jetsetters show displays their drive to remain in the spotlight they have established for themselves with successful performances in the past. The show is called “WE. ARE. HERE.” Music in the show includes “Big Time”, “I’m a Star” with soloist Kiera Hairston, “The Distance You Have Come” with soloist Char’Metria Threats, “Disconnected” with trio Phoebe Jackson, Braijon Clayton, and Destini Howard, and “Break My Stride". The singing and dancing group is in its sixth year at Alliance High School. In their short competition history the Jetsetters have captivated audiences bringing home several division Champion titles and numerous caption awards including, People’s Choice, Best Costumes, Spirit Award, Best Show Concept, Best Choreography, and Best Vocals. Jetsetters choreography is created by Randall S. Lanoue. The group is directed by Carrie Chunat and Assistant Director Brett Cowden. The group will participate in competitions on January 27 at Findlay High School, February 24 at Twinsburg High School, and March 17 at Sheridan High School.